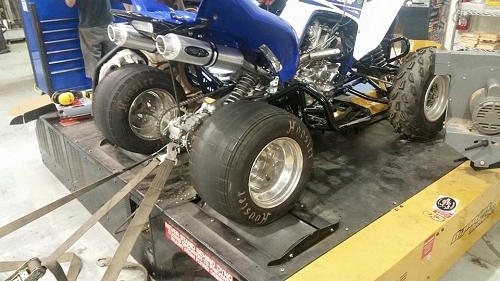 EHS Racing Dyno service and appointment deposit. This can be used to schedule appointments and pay for service while at the Dyno if your using a credit card. Street bikes and cruisers are extra and only weekday appointments. TUNING DOES NOT FIX, blown head gaskets, efi sensors, clogged carbs, engine problems, jacked up wiring, and many other associated problems. It may aid in the diagnostic of these problems but it does not correct them. If your machine requires more work than tuning it is not included in above price. If your machine can not make it through an appointment it does not mean you do not have to pay for the appointment. We have had many bikes come and need a crankshaft and not even make it to the dyno, we understand everyone is not a mechanic and our happy to fix, diagnose, correct all these issues but pushing forward we are trying to minimize waisted time. Sometimes a little due diligence will save us both $$. IF YOU MISS your agreed upon arrival time by 30 mins you will forfeit your deposit. ESPECIALLY on a SATURDAY please do not call and ask if its ok im running behind on Saturday, it is not. We dont mind waiting but the only reason we will be here on a SATURDAY is to provide the services requested secured by deposit. IF your late past 30 mins on a Saturday your $250 session will be $350. We will work with people on a case by case basis during the week but if your late expect the $25 extra charge. ANY APPOINTMENT not changed or altered before 48 hours of actual appointment will forfeit deposit. (you have 2 days to make sure your going to be here call or fill out a ticket on this website if you cant make it, Then we will reschedule it for free no charge prior to 48 hours). 2 reschedule max we know stuff happens this should cover anything that arises. Hopefully soon a calendar feature will be added to this product until then in notes section please put your requested time for appointment. ALL appointments must be confirmed by phone or email we will contact you to be sure and schedule/lock it in. IF your requesting a SATURDAY appointment select quantity 4 of the $25 units. ANY appointment deposit that we can not honor desired time or after we call and we can not fit your time frame we will be happy to refund.